When thinking about how to make your dorm room comfortable, there’s a key area of your dorm that you’ll have to consider. No, we don’t mean your Twin XL bed…we mean your floor! That floor should be made as comfy as it can, as it will have a surprising difference on the overall comfort level of your dorm room. Now, you might be thinking, what’s the big deal? It’s only the floor. While dorm floors aren’t made of cobblestone or (hopefully not) concrete, they’re generally regular, hard, thinly carpeted surfaces. In fact, you'll be lucky if your college dorm room floor has carpeting! And although you probably won’t be sleeping on the floor, the difference between a mildly comfortable floor and one that’s covered by, say, a warm and soft plush rug can be astounding! It’s true that ru gs for college are primarily dorm room decorations, yet their ability to serve as comfort-adding college supplies can’t be overlooked. 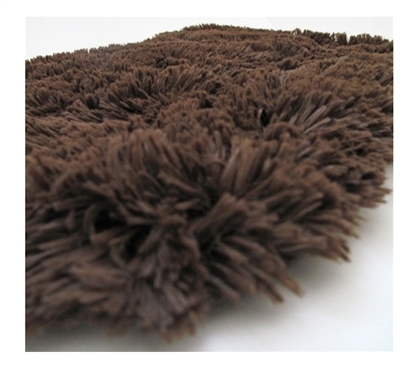 Not all rugs are made of the same material, of course, so look for shag rugs or plush rugs if you want the biggest boost in comfort. And while rugs differ in their material type, from wool, to polyester, to other fabrics, softness can come in a variety of fabric types. In fact, some polyesters are softer than natural materials! You’ll have to also consider where you’ll place your dorm room rug. The good thing here is that, since dorm rooms are so small, wherever you place your area rug, it’s bound to get stepped on! And that’s a good thing if you have a comfy rug. Typically, rugs that are around 3’ x 5’ are best placed off center or by your bed. Rugs that are around 4’ x 6’ look best in the center of your dorm or even off center, and rugs that are around 5’ x 7’ and larger should be placed in the center of your dorm, typically. Larger rugs can also stretch underneath some of your college furniture too. Remember, nothing beats the feeling of waking up and placing your feet atop a soft, warm rug next to your bed, especially on a cold day!